On Sunday, October 18, 1587, the galleon Nuestra Señora de Esperanza under the command of Pedro de Unamuno came into a bay somewhere in Central California. Since Unamuno reached that port on the day of San Lucas, he named it Puerto de San Lucas. From their ship, Unamuno and his men noticed two Indians on a hillside watching them. A council was convened on board ship and it decided to send a landing party ashore to explore and take the port in the name of King Philip. The party came ashore in two groups: a group of twelve soldiers with coats of mail and arquebuses led by Unamuno himself and another group of Luzon indios of undetermined number led by the priest from Macao, Fr. Martin Ignacio de Loyola. Fr. Martin carried a cross in his hands while the indios were equipped with swords and shields. With two indio scouts leading the way, they saw five Indians in the distance (plus two babies carried by two Indian women on their backs). They made every effort to get and talk to them, but the Indians were fleet of foot and easily left them behind as they scrambled up the hill. The shore party explored around for a while before finally erecting a cross to take possession of the territory for the King and returning to the Esperanza. On Monday, October 19th, Unamuno came ashore again with twelve soldiers and a group of eight Luzon indios. This time the indios were led by Fr. Francisco de Noguera. They landed before dawn and again sent two indio scouts ahead going in a direction different from the one they had taken previously. They found evidence of habitation including footprints, a camp, and seventeen dugouts of various sizes. It seemed that the native population was trying hard to avoid being seen. The rest of the day was uneventful and Unamuno’s party camped for the night under great oak trees near a river but away from the trail. The next day, Tuesday, October 20, they proceeded to come down from the hills to return to their ship. They came upon another abandoned Indian camp, set on both sides of the river, and saw thirty dugouts similar to those they had seen the day before. They continued on their way to the beach. Many more Indians came descending from the hill to attack but Unamuno’s party was soon joined by reinforcements from their ship who had seen what was going on. Their superior firepower finally drove the Indians off and only one more soldier was wounded in addition to previous casualties. At five in the afternoon, they made they way back to their ship as the Indians had withdrawn on account of approaching darkness. Unbeknownst to those in the landing party, there had been an incident on Monday, October 19th that could explain why they encountered no Indians that day and why they were attacked the next day. Fr. Martin, who was with the original landing party, and some of those who stayed behind on the ship went ashore to check out a fire they had seen the night before and also to get wood and water. A Spaniard, armed with only a sword, was left to supervise a party of indios in washing clothes, gathering firewood, and obtaining fresh water while the rest of Fr. Martin’s party went on to investigate the site where the fires were seen the night before. As the indio team was doing its chores, twenty-three Indians came down the hill to check out what they were doing. The Indians, knowing they were in control, confiscated some clothes being washed and a few water casks and took them up the hill as booty. They came back to continue watching what the intruders were doing. At this point, Fr. Martin and the others came back from their foray. The Indians were apparently upset because they were led to believe that there were no visitors other than those they had been watching. The Indians tried to capture the team leader but were prevented from doing so by arquebus shots from the ship. After much threat and some fighting, the Indians withdrew with some of their wounded and Fr. Martin’s party returned to the Esperanza. Fr. Martin and his party had unwittingly set the stage for the attack the next day on Unamuno’s party as they made their way back to their ship. That evening another council was held on board ship and it decided to leave and continue on to Acapulco before daybreak the next day, Wednesday, October 21, 1587. This article was rewritten for the World Wide Web and first appeared in the November 1995 issue (2: 8) of Sulat sa Tansô. Licuanan, Virginia Benitez and José Llavado Mira. The Philippines under Spain: A compilation and translation of original documents, Book IV (1583-1590). Manila, 1993. Mathes, W. Michael. The capture of the Santa Ana, Cabo San Lucas, November, 1587. Los Angeles, 1969. Santos, Hector. 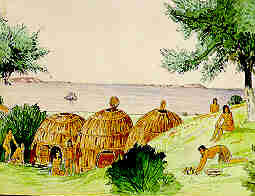 "The first Philippine indios in California" in Sulat sa Tansô at http://www.bibingka.com/sst/esperanza/indios.htm. US, April 3, 1997. Did Philippine indios really land in Morro Bay?